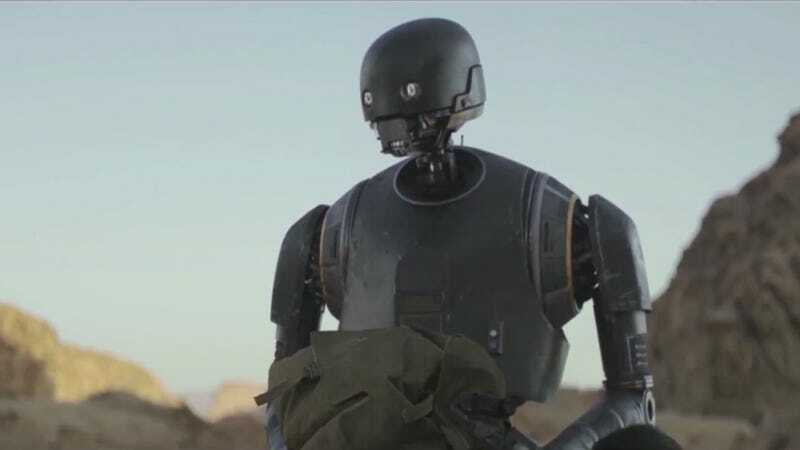 There are loads of exciting things coming with the release of Rogue One: A Star Wars Story but high on that list is K-2SO, the surly droid voiced and motion-captured by Firefly’s Alan Tudyk. The actor dropped a few new details about the droid’s history and his less-than-sunny personality. In a new interview with Entertainment Weekly, Tudyk dropped a few more hints about his sure to be popular character. Like, for example, Kaytoo is seven feet, one inch tall and was formerly a security droid for the Empire. An enforcer and guard, hence the size and demeanor. He’s since been reprogrammed to be a sidekick to Rebel captain Cassian Andor, played by Diego Luna. If you followed the news at Star Wars Celebration Europe, you may know that Kaytoo (as he’s called by his friends) is a bit of a curmudgeon, described as an “old person” by Tudyk. “He can say insulting things very casually if he thinks they’re true,” the actor added. The droid doesn’t really feel or exhibit emotion, unlike some of his counterparts. And finally, Kaytoo and Cassian have been inseparable for several years by the time Rogue One starts. Odds are we’ll see more of Kaytoo soon as there’s a new Rogue One trailer hitting the Internet on Thursday.